Myolie Wu (胡杏兒) and Johnson Lee (李思捷) fooled the fans and the media with an early April Fool’s joke this week when the pair were on a vacation to South Korea. Photos of Myolie and Johnson holding hands at the airport were circulated online and Myolie uploaded a photo of herself hugging a man who resembled Johnson, implying that she and Johnson have begun dating. Twelve hours after the reveal, Myolie admitted to fans that it was just a prank, upsetting many fans. Realizing that she may have taken the joke a bit too far, Myolie immediately apologized to her fans. “I promise I won’t lie to everyone again!” she wrote on her Weibo blog. However, recent reports surfaced claiming that Johnson had indeed attempted to pursue Myolie for the past three months and even convinced their mutual friend Paisley Wu (胡蓓蔚) to help him out. Last month, Myolie boldly admitted that she had a pursuer, and even revealed that she received flowers on Valentine’s Day. The rumors claimed that the flowers were actually from Johnson. 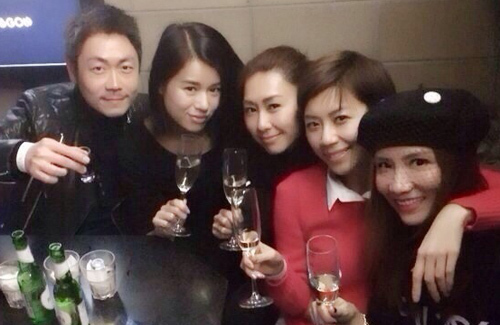 Reportedly, Myolie’s trip to South Korea was only with her close girlfriends, but Johnson insisted to tag along. Despite Johnson’s passionate pursuit for her affections, Myolie ultimately turned him down. 10 comments to Johnson Lee Actually Pursued Myolie Wu? Johnson Lee really a idiot prawn face. Personally I don’t think Myolie Wu will choose Johnson Lee a her pursuer after her lessons with Bosco Wong. Bosco and Johnson have very similar personalities. Na Myolie is a smart lady. Talk about the media trying to save face. They were made to look like fools by Myolie, and now they are catching at straws. They said there are recent reports that the pursuer who sent Myolie flowers was Johnson Lee. How come this is all coming out after they were embarrassed by Myolie and Johnson. Why did this not come out before. Talk about petty, childish, backward, ignorant rift raft behaviour from the media. Then again, such behaviour goes with the territory. lols… poor Johnson… dragged into the Myolie media whirlpool! Johnson lee have a new show coming out soon!! I think when the show air!! We will know the truth! talk about the toad and the swam. and he’s proven to not be a loyal man.